There is tension in Owerri, Imo State capital right now, to the extent that could be felt in the air. It is over the roll of the government demolition machines into the Owerri Main Market on Douglas Road. The Sun realized that the notice for that action has been posted and the traders and natives kept vigil in the market while some traders did the much they can to rescue some of their movable valuables. However, early this morning, the government demolition team arrived and descended on the market with fury that has led to tears and agony. 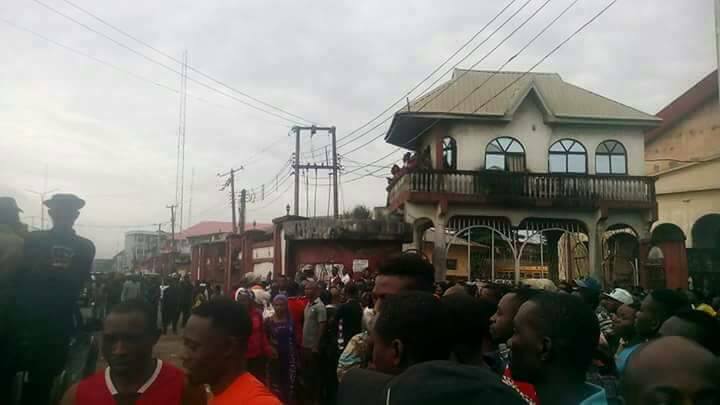 There is also unconfirmed rumours that a 12-year-old boy has been caught down in an untargeted bullet allegedly from armed government officers that accompanied the demolition team in anticipation of resistance by the traders. A major shopping plaza that signposts the market as t now is already pulled down completely.